Oh Bummer! Will Trump undo the Asia Pivot? Donald Trump may be the most powerful man on earth but he is a victim of his own insecurities. The Commander in Chief is reportedly driven by a crude obsession of undoing his predecessor’s policies regardless of its merit. However, of the many Obama-era policies he would like to see upended, there is one which he simply cannot afford to have reversed, which is the “Pivot to Asia”. The pivot, a strategy of rebalance towards East Asia, is an indication from Washington that it is still invested in the region and would not want to see its regional superiority challenged by a rising China. Trump’s rescindment from the Trans Pacific Partnership Agreement (TPPA), an Obama era trade agreement between 12 countries (excluding China); four of which are ASEAN member states (Malaysia, Singapore, Vietnam and Brunei), may have led many to believe that he has successfully terminated the pivot. However, the TPPA was only part of a broader regional doctrine that encompassed the strengthening of bilateral security relations, development of working relationships with emerging powers including China, participation in multilateral engagements, trade and investment intensification, the establishment of a broad military presence and the advocacy of democratic values. The Republican President’s death knell to the TPPA, is not without severe implications to the geopolitical jostling between the US and China within the region. Beijing is eager to conclude negotiations of the Regional Comprehensive Economic Partnership (RCEP) which includes itself, all ten ASEAN member states and five other countries that ASEAN already has free trade agreements with. However, it does reveals an intention to restructure the pivot from his Democrat antecedent, instead of revoking it altogether. Washington is already in the midst of a shift in geopolitical current within the region. Beijing’s charm offensive has seen its investments within ASEAN states like the Philippines, Malaysia and Cambodia skyrocket. Critics of Obama’s strategy claim that the pivot was received by Beijing as an effort to contain what it considers to be a “peaceful rise”, leading the latter to respond more aggressively, threatening the delicate balance of the region. Chinese efforts to militarise the South China Sea are an example of Beijing’s aggressive conduct. The US is still a strong trading partner of ASEAN. However, China is fast catching up while US economic influence has waned. American investment into ASEAN is comparatively higher at US$ 13.6B compared to China at US$ 8.2B in 2015. However, China’s share of FDI into ASEAN has seen an increase to 6.8% in 2015 from 5.1% in 2013 whereas US share has remained relatively unchanged since 2014. In comparison to the US, China has a larger share of total exports and imports with ASEAN and its overall share of total ASEAN trade in 2015 is 15.2%, second only to the cumulative share of intra-ASEAN trade. In light of such events, Trump cannot lose sight of Southeast Asia. He must return to the foreign policy drawing board and rethink its strategy for the region. An analysis published by the Singapore based ISEAS-Yusuf Ishak Institute concluded that there is limited engagement in Southeast Asia compared to Trump’s focus in other foreign policy areas such as Europe and the Middle East. However, the actions of his administration including the visits by his Vice President, Mike Pence and Secretary of State, Rex Tillerson and Trump’s planned participation in the US-ASEAN Summit later this year, indicate that this region is still very much under the Trump radar. It is imperative for the US to fall back onto the “hub and spokes” model, the original East Asia foreign policy framework adopted at the end of the Second World War. The model places the superpower as the central anchor of bilateral security and economic ties with countries at the receiving end of the “spoke” (Japan, South Korea, Taiwan and Southeast Asian nations). This doctrine hinges on a trade-off between providing market access and security guarantee for the East Asian nations (including the 10 ASEAN countries), in return for a strategic partnership with these countries and by extension, a strong and validated American presence within the region. The strategy endured the Vietnam War and the broader communist threats of the Cold War era and evolved to accommodate multilateral dialogues. However, the rise of China, has since thrown a spanner in the works of US foreign policy conduct in Southeast Asia. Unlike the Soviet Union which promoted a socialist system which was in stark contrast of Western capitalism, China, seeks to play by the rules of the liberal international system as it pursues its regional ambitions. Hence, by relying on the “hub and spokes” model, the US would be able to leverage on its security guarantee to substantiate its military presence in deterrence to Chinese aggressiveness in the South China Sea. The White House should also encourage more forms of multilateral economic engagements which would intertwine the economic and political fates of states within the region even further. The US stands to gain from more enmeshed relations as such interdependencies are reliant on each economy remaining salubrious, making conflict a less favourable option. In a similar vein, Washington should take advantage of the Trump persona in revitalising US soft power in the region. Trump’s brash attitude may cause him to lose friends in the Western world but in Southeast Asia, a brazen, “strong man” projection can help the US gain currency in terms of its “personal brand”, especially in countries like Vietnam and the Philippines, two key players in the South China Sea dispute. A recent Pew survey concluded that 69% of Filipinos have confidence in Trump’s abilities to manage international affairs and 72% of Vietnamese perceive Trump as a strong leader. Professor of Politics and International Affairs at Princeton University, Dr John Ikenberry, postulated in his book, Liberal Leviathan: The Origins, Crisis and Transformation of the American World Order, that the liberal hegemonic order which was built and managed by the US in the aftermath of the Second World War is currently suffering a “crisis of authority”. Competing powers like China are looking to co-opt into the system instead of overhauling it completely. 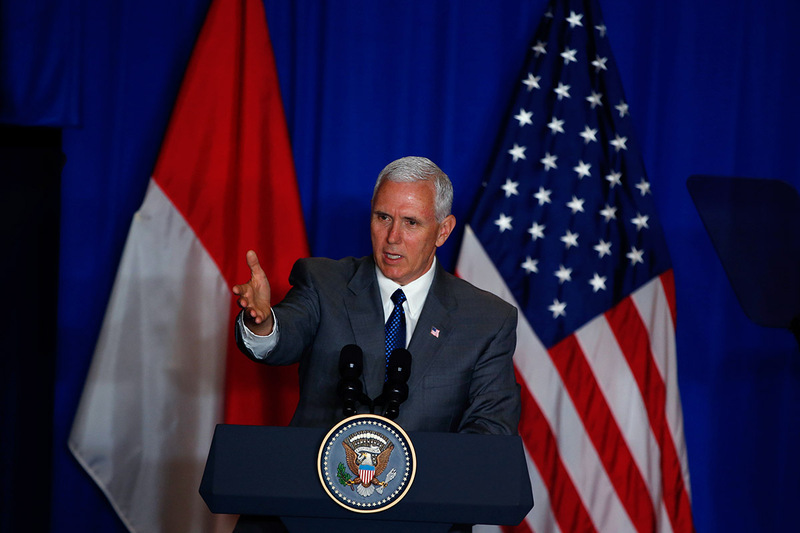 Faced with such challenges, it is only natural for Washington respond to these challenges by increasing its engagement with the Southeast Asian region even more. Maybe someone from the Trump administration can convince him to do so by suggesting that the pivot was all his idea in the first place.